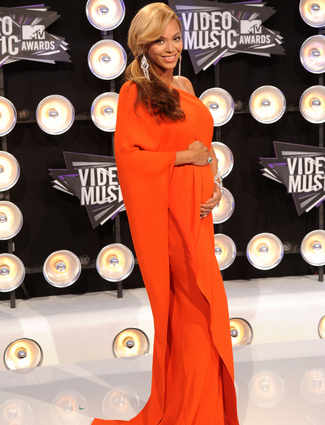 Beyonce stole the show when she showed off her newest accessory, a baby bump. It almost didn't matter what she was wearing, yet here she is, looking flawless as usual in what already looks to be an epic maternity wardrobe. Somewhere, a child weeps softly because Nicki Minaj made off with the contents of her toy chest. Does anyone remember that toy "Lite Brite" from the late 1980s? Deena's dress reminds me of the patterns I attempted to make on my Lite Brite as a kid. Also, Snooki wants her children of the corn contact lenses back. Although we must deduct points for the presence of a mullet dress (mini or maxi--pick a side! ), Selena Gomez continued her red carpet hit parade with this Black Swan ice dancer number. Bonus points for wearing her hair in a rare updo hairstyle. Rachel Bilson looked gorgeous in black leather shorts paired with a white top and black blazer at the Chanel Cruise show. Karlie Kloss models for H&M's fall 2011 lookbook and looks absolutely amazing wearing the brand's designs.